Ever since I discovered Tim Holtz two years ago, I have been watching and learning his techniques, but I have only started collecting his products quite recently. I just purchased my very first piece of Ideology - Chit Chat stickers, so imagine my joy when I saw Tim's January Tag!! I took it as a sign that it was time to jump on the bandwagon, so off we go with Tim's January Tag!! As you can see, I really didn't venture too far from Tim's version. I really wanted to concentrate on the techniques and the style. It's hard to resist putting flowers and pearls on a project! I did have to make some adjustments because I don't have all of the correct products, but I think I did a fair job with what I had. I won't go into details about the techniques, you should really learn those from the master himself. I am only going to point out the items I jerry-rigged out of what I had on hand. I made my own tissue with a bunch of Tim Holtz stamps, but honesty, it was a waste of time because you can't see the design at all. The letters were all cut out from Spellbinders Lowercase set three times and layered together to get them to look more dimensional. 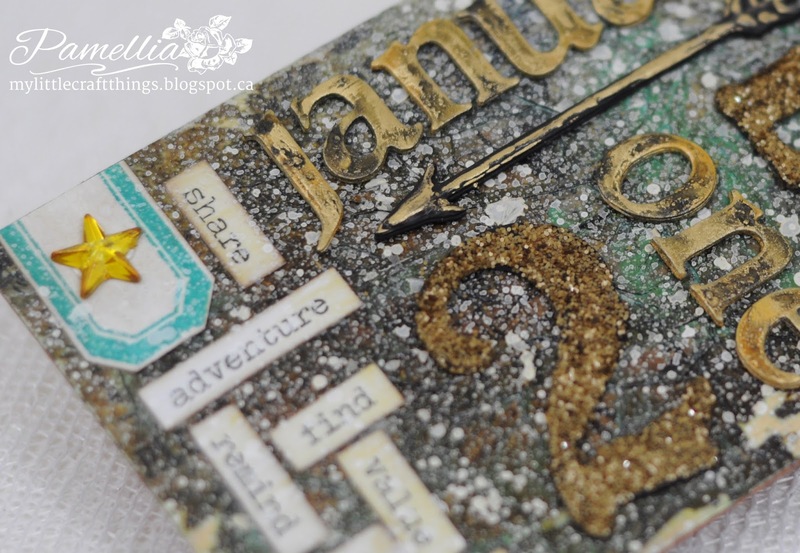 The 2 and the 5 were cut out from Tim Holtz's Vintage Noel die and also layered. 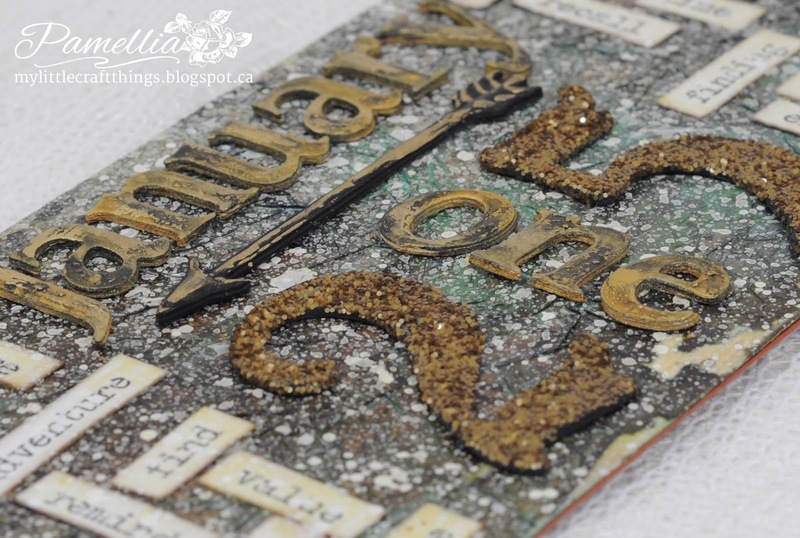 The arrow was cut out from Tim Holtz's Love Struck. I once again layered up three pieces of it and then I took some liquid pearls and drew on the top of it to give it that bevelled appearance, painted it all black and highlighted it with Tarnished Brass. I used the frame from Simple Sayings in Peacock Feathers and coloured the star with Sunset Yellow alcohol ink. All of the rest of the products I used are the same ones Tim used on his tag. The only thing I forgot to do was outline all the chit chat stickers with a black marker...DOH!!! Apols I have probably missed some of your posts, our internet issues continue and we pend more time without that with service, but they promise it will all be sorted by Monday, I wonder ? What can I say about your Timmy tag other than WOW, so much lovely texture and the metallics against the blues really make it pop, one wonderful piece of artwork. Beautiful tag Pamellia! Love all the shimmery detail! Great take on Tim's challenge! Hi Pamellia: Welcome to Tim's tags. I've been doing them for several years now but not always all twelve each year. I think the best part is "thinking outside the box" when we don't always have his products. Really like how you created your numbers and the arrow to give them that extra dimension. Well done! Gorgeous tag Pamellia! I love all of the beautiful textures and sparkly numbers! Fabulous take on Tim's tag! Gorgeous Pamellia, love it all, you have done so well, not a gem or flower in sight lol! Well done my friend. Super cool texture. I bet this just feels all rough and scratchy and yummy in your hands. I'm glad you got to use some of your new goodies! This is gorgeous Pamellia, I love the way you have done the background and your detailing is wonderful. LMAO @ jerry-rigged - you do use some pretty cool language :) As always you do such a wonderful job, and I love how you made your own elements by layering instead of buying new bits. The whole tag has come together beautifully and it's a great take on his with your own techniques thrown in too. 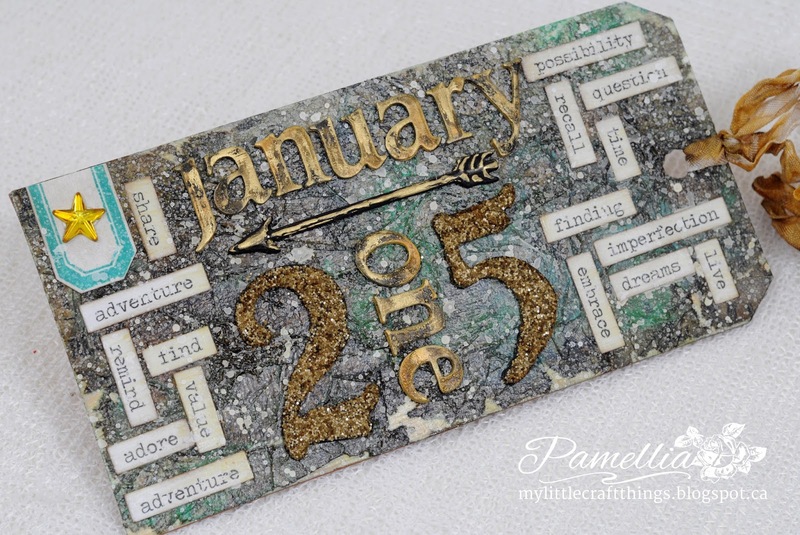 Absolutely brilliant tag Pamellia, I am always in awe of crafters who create these types of projects, to me they are works of art, the only Tim Holtz products I use is the ink pads, lol, I love what you have done here, superb creation. This is brilliant Pamellia, your background is perfect, a great take on Tim's tag - I will look forward to the next one! Superb detailing as usual Mrs J. That should've been bits not nits doh! LOVE the January addition! Very cool take! A great take on Tim's tag Pamellia! you are THE BEST at making pieces from what you have - your letters and arrow are spectacular - and your background is SO speckled! 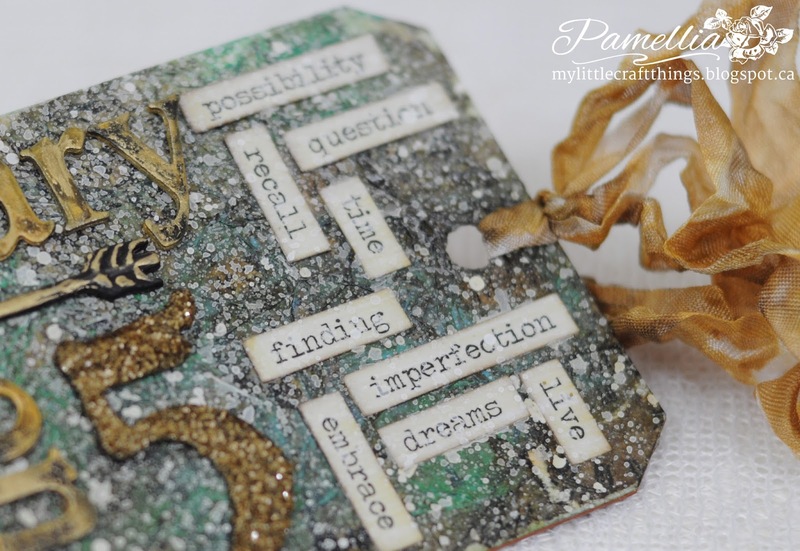 This is rather gorgeous Pamellia, I love the chunky feel it has, the depth you have given the letters and the solid glitter. You have done a wonderful job. A shining tag, Pamellia! 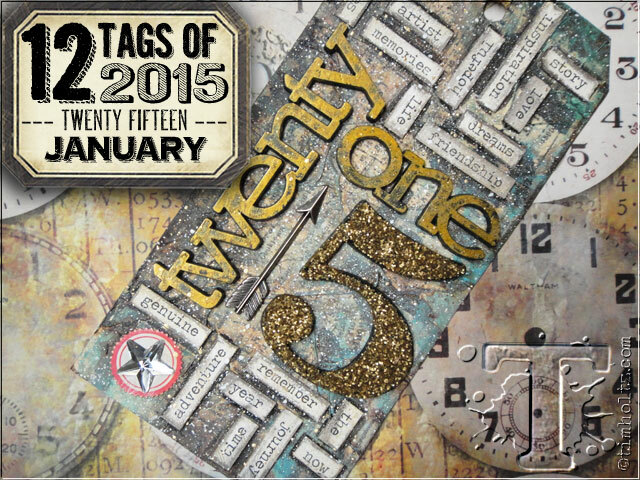 A wonderful promise for your beginning collection of 2015' Tim's tags, ;)! 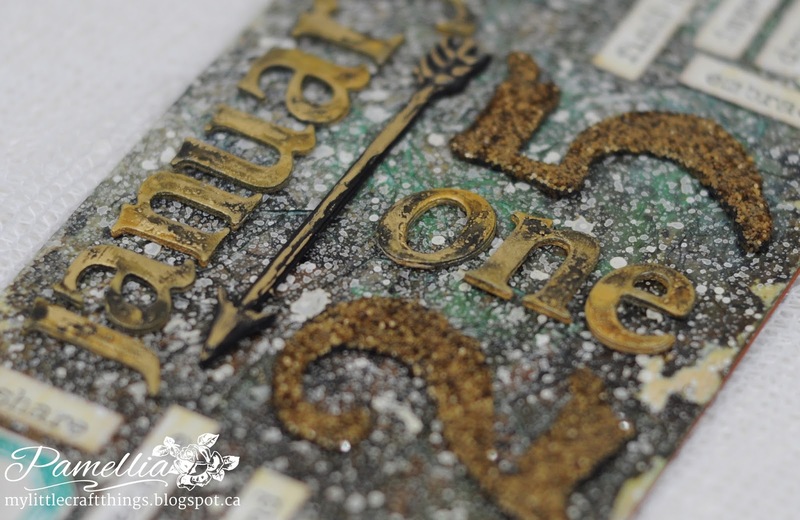 A gorgeous, glittery version of Tim Holtz's tag. Sally.x. Just perfect Pamelia, another gorgeous creation! Absolutely fabulous!! Me thinks you could even show Tim a thing or two! Alright Bubbles! I see what you mean about jerry riggin the tag. Great minds think outside the box! Your take on the Tim tag is amazeballs and so grungly (TM) perfect! Awesomesauce! Big Hugz! Pamellia, it looks like I'm a little late to the party, but what a party you have going on here! I adore your tag and I'm so happy you ventured into Tim's tags! I might say you did a F A N T A B U L O U S job here, too! The layering up of the die cuts is genius and so well done--you would think they were cut from metal! I'm so impressed with your creativity to use what you have to achieve "the look". Another winner here, my dear! Here's to eleven more this year! Hugs! Christmas Blessings for my 100th Post! !